This was not an official Test Match as the organisers were not prepared to pay an extra fee to the FIM for official approval. 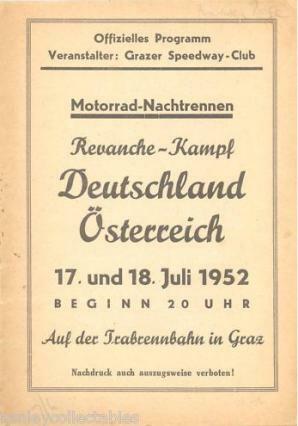 The FIM retaliated by not allowing the teams to be billed as Austria and Germany, so it was re-billed as Vienna v Munich - though the two teams were of course full international teams. Leopold Killmeyer 16 Josef Hofmeister ? Josef Chalupa ? Fred Aberl ? Josef Worschnigg ? Gerhard Hofmeister ? Franz Aigner ? Fred Hamberger ? Franz Schenk (Aut, res) ?  Local reserve Schenk replaced the injured Gerhard Hofmeister in 3 rides in the second half of this Test Match. comprised 6 riders, scoring 4-3-2-1-0-0.